LAGOS FEBRUARY 2ND (URHOBOTODAY)-Delta State Governor, Dr Emmanuel Uduaghan has said peaceful elections in Nigeria cannot be compromised as the nation cannot afford to fail because of its implications for the unity of the country. 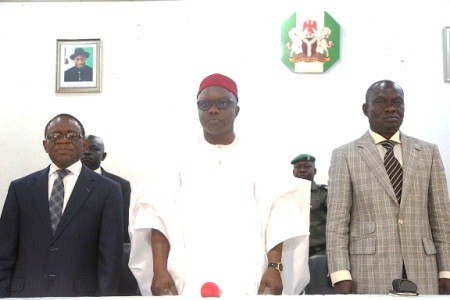 Speaking Monday in Asaba at a Voters Education meeting with traditional rulers Governor Uduaghan stated that all hands must be on deck to ensure that the nation got it right as the consequences of failure would be too disastrous. He said that the Government, the Independent National Electoral Commission (INEC), security agencies and stakeholders were working together to ensure that the forthcoming elections would be free and fair as well as devoid of any form of violence. “As much as possible we want to totally remove violence during elections and one way of achieving this is through proper voter education. You know ignorance can lead to violence and there are so many people out there that are not well informed about issues surrounding the temporary voters’ card, permanent voters’ card, the voting process etc”, he stated. He disclosed that there were still about six hundred thousand permanent voters’ cards that are yet to be collected and urged traditional rulers to inform their subjects to endeavour to collect their voters’ cards before the deadline. Uduaghan observed that Delta State has recorded peaceful electioneering campaigns and informed the traditional rulers that President Goodluck Jonathan would lead the campaign train of the Peoples Democratic Party (PDP) to Asaba tomorrow (Wednesday) for a campaign rally and urged all Deltans to remain peaceful throughout the period. “We are expecting the visit of the Mr. President to be very peaceful even as the All Progressive Congress (APC) Presidential candidate, Mohammedu Buhari had a peaceful campaign in the state disclosing that security agencies were collaborating to ensure a hitch-free visit by the President and his team. He enjoined security agencies to be more vigilant after the Presidential elections, noting that the state elections are more competitive in Delta State. The resident electoral commissioner (REC) in Delta State, Elder Aniedi Ikoiwak said INEC was prepared for peaceful, free, fair and credible elections, disclosing that logistics have been put in place for accreditation of voters to commence at exactly 8.00 am on the day of elections. He emphasized that voting can only be done with the permanent voter’s cards and by the owners of such cards as electronic card readers have been procured to ensure that voting cannot be done by proxy. 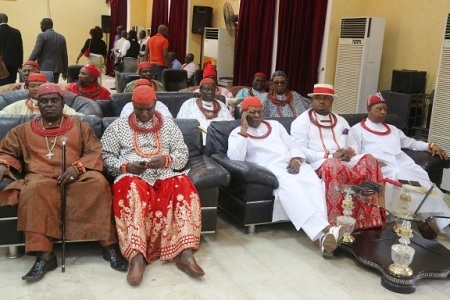 Traditional rulers who spoke at the occasion promised to enlighten their subjects on the need to collect their PVCs while heads of security agencies assured Deltans that no stone would be left unturned to ensure peaceful and successful elections. They warned trouble makers to desist from entering the election venues as they were prepared to prosecute anybody caught engaging in actions that are detrimental to the electioneering process. How many Anioma traditional rulers campaigning for Chief G Ogboru or Chief O’tega Emerhior?